BROWARD COUNTY, Fla. - A family of three wasn't hurt after a pickup truck crashed into their home Tuesday night near Fort Lauderdale. The crash occurred just after 10 p.m. at 1700 SW 44th Ave. in the Broadview Park neighborhood. Broward Sheriff's Office Department of Fire Rescue Battalion Chief Michael Kane said the residents were asleep when the Toyota pickup truck crashed into their living room. Kane said the driver of the truck then sped away, leaving the front bumper behind. The residents were in another room at the time of the crash and weren't injured, but firefighters said the house had significant structural damage and it would be unsafe for them to remain there. 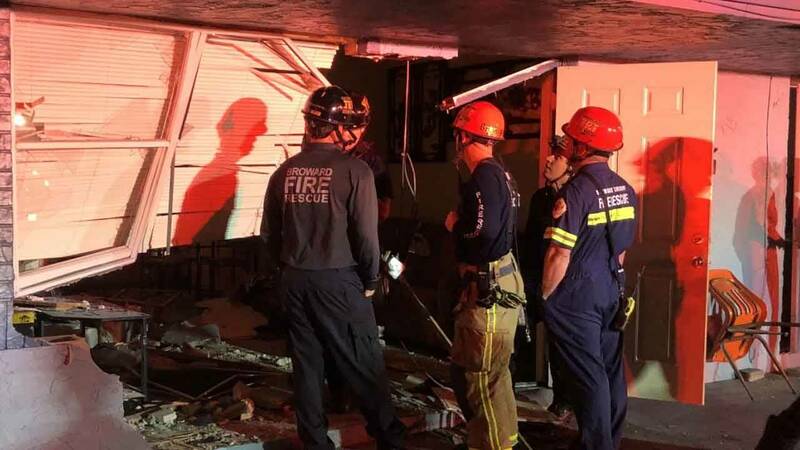 Firefighters determine that there was significant structural damage to a home after a pickup truck crashed into the living room Monday night on Southwest 44th Avenue. They were staying with friends until repairs are made. It was not immediately known if the BSO was searching for the driver who fled the scene of the crash.